String searches in most applications are based on the “contains” or “begins-with” paradigms – which are implemented by the use of the LIKE logical operator. 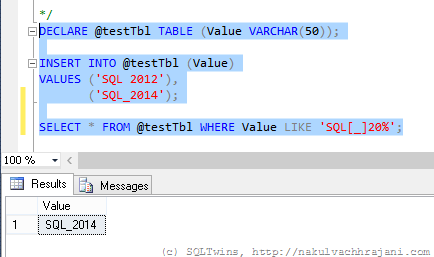 The LIKE operator allows for the use of wildcard characters (underscore being one of them), which is the part that most people unknowingly overlook when they have been working with T-SQL for quite some time. As can be seen in the screenshot above, the results are not what one would expect them to be at the first glance. 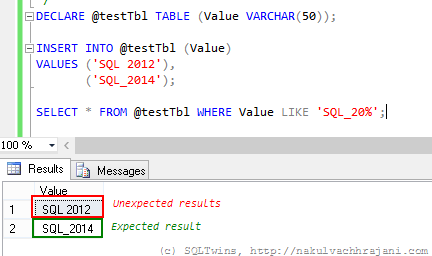 One would have expected it to return only the string “SQL_2014” and yet the T-SQL query is returning both the records. There are not one, but two possible solutions to choose from to work around this issue. Because we want to consider the underscore as a character and not as a wildcard, the easiest thing to do would be to surround it with square brackets, similar to what is shown in the query below. The other option, which I have discussed in one of my earlier posts, is to use the ESCAPE keyword. The ESCAPE keyword works on the basis of a user specified escape sequence. When encountered, the query engine will simply ignore the wildcard character and treat it as a normal character. The moral here is that one must always remember the basics – this thumb rule not only applies to software, but in everything that we go about doing in our day to day lives. The other key learning that I encourage everyone to take from this is that Occam’s Razor is real – from the multiple explanations that a problem may have, the explanation with the least number of assumptions should be selected as the answer. In this case, the simplest theory was – human error, which was indeed the case. 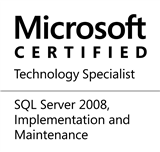 This entry was posted in #SQLServer and tagged #SQLServer, #TSQL, Best Practices, DBA, Debugging, Development, Guidance, Myths, Tips on July 27, 2015 by nakulvachhrajani.